Home | Spill Control, Containment / Decontamination Products | Safety Storage Cabinets | Safety Cabinets For Pesticides | Specially sized Pesticide Safety Cabinets improve safety and convenience. (891204):1 door, manual, compac 12 Gallon 35" x 23.25" x 18". (891224):1 door, self-close, compac 12 Gallon 35" x 23.25" x 18". (892604):2 door, manual, undercounter 24 Gallon 35" x 36" x 22". (SC29741P):1 door, self-close, undercounter 24 Gallon 35" x 36" x 22". 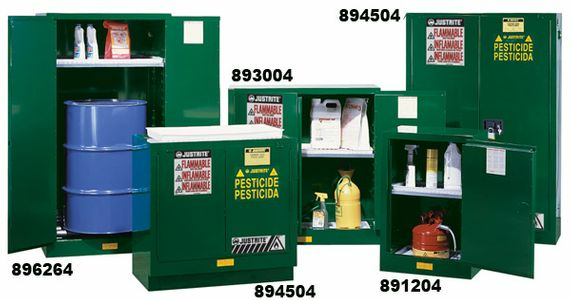 Smaller storage capacity safety cabinets aid in segregation and allow liquids to be stored at the worksite eliminating the potential for drips and spills during the transfer of pesticides. Dissimilar pesticides stored separately prevent one pesticide from contaminating another or accidental use of the wrong chemical.